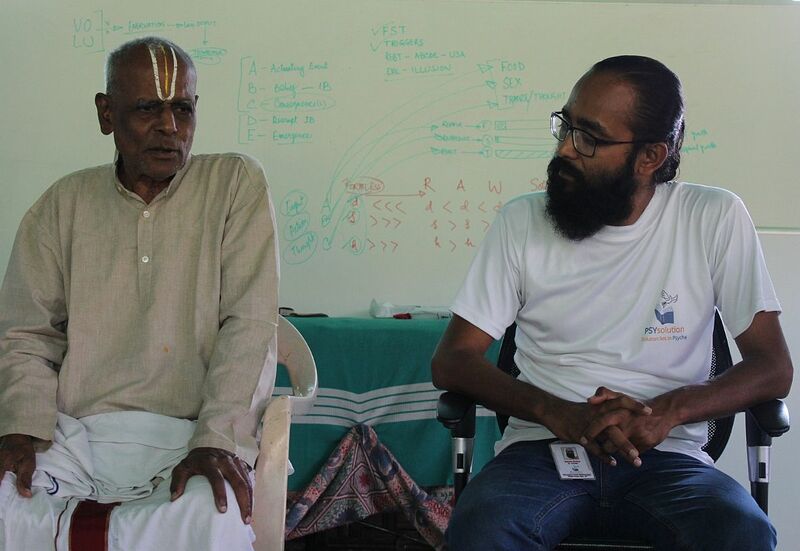 As a conclusion to monsoon 2018 series of Nature Cure camps, a Level 1 course was offered by Kalyan of PSYsolution supported by aKarma Life volunteers. It was a week long course offered as a gift from 2nd to 8th September 2018. Dozen plus participants came together to unlearn, relearn and learn about physical, physiological and psychological health through the process of contemplation and discussion. The environment and food at Sadhana Farms in Pollachi was conducive for participants to integrate these aspects as part of their experience. Participants also enthusiastically engaged in philosophical discussions like mind over matter as well as functional discussions like improving eye sight. There were 2 classroom sessions before and after lunch. And additional discussions on health were taken up post-dinner. Participants also went through the exercise of going deeper and offering their contributions from a framework of ‘I Value You’. During the valedictory address by 85 year old Balakrishnan Aiya who has been a long time Nature Cure educator, participants received a self signed certificate with ‘commitment to health. It was co-signed by centenarian Padma Amma, a long time Nature Cure practitioner who motivated the participants with her very presence. When participants were asked a question by Bala Krishnan Aiya, they took a deep pause and came up with well thought out answers which confirmed that the process of contemplation had set in. The group had become cohesive during the course of the course and every one expressed the wish to stay in touch and support one another. Many any participants chimed in on group chat about how they braved trays and trays of snacks and coffee/tea that passed by (with contemplation) on their train rides back home, marking the continuation of their individual journeys towards health and happiness.